Dear Mr. Williams, Thank you very much for your prompt response. Filip, Belgium. 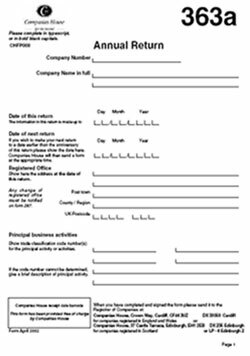 An annual return is a form which shows information relating to a company as at a certain date. The information which is included in the document includes the names, addresses, occupations and nationalities of the directors and secretaries, its incorporation number, its registered office location and the type of company. In addition, details as to when the annual return has been completed to will be given. When a company is limited by shares, the book value of the shares in issue and the holders of such equity will also be provided. Annual returns are submitted each year and would contain information which was correct at the anniversary date of the company’s incorporation. Occasionally, the date to which the document is made up to would be a date other than the anniversary and in such circumstances, would be from the date of the previous return. Annual returns are usually sent out to the company’s registered office address at least two weeks before the date to which it must be made up to. The delivery deadline for submission is again twenty eight days after the period which the return covers.